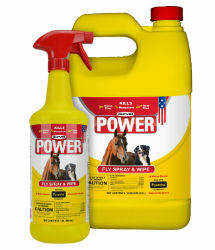 A non-oily insect control spray that provides powerful yet safe protection against harmful pests. Made with Pyranha® technology, this economical and quality formula can be used directly on horses and dogs as well as premises (barns, stables, fences, etc.) featuring both indoor and outdoor applications. Citronella scented. Won’t attract dust and grime. Can be sprayed or wiped on. Kills flies, mosquitoes, and deer flies. WIPE-ON USE: Thoroughly brush horse to remove excess dirt and dust. Extremely dirty horses should be shampooed, rinsed adn allowed to dry before applying wipe. Use a sponge or clean soft cloth or mitt. Apply liberally (1-2 ounces) over areas to be protected. Pay special attention to legs, belly, shoulders, neck and facial areas. Do not get in eyes and mucous membranes. TRIGGER SPRAY USE: Remove excess dirt and dust. apply 1-2 ounces as a light spray mist to coat while brushing lightly against lay of the hair. do not spray in eyes and mucous membranes. Apply with sponge or soft cloth around those areas. ON DOGS TO KILL FLEAS: Apply as a spray starting at the tail then spray over entire hair coat while moving the dispenser rapidly. Apply the spray lightly over the entire body with even coverage until the tips of the hair are moist. do not spray into the eyes, face or genitalia. Using gloves, rub the product into the coat by ruffling the hair so the product reaches the skin. Allow dog to air dry or blow dry. do not towel dry. Do not reapply more than once every 14 days. TO KILL FLEAS, BLACKLEGGED TICKS & LONE STAR TICKS IN ANIMAL QUARTERS: Spray to lightly dampen surfaces. Thoroughly spray infested areas, pet beds and resting quarters, cracks and crevices, window and door frames as well as localized areas of floor.